HTC officially launched Desire VC dual Sim android phone in India partner with TATA docomo. 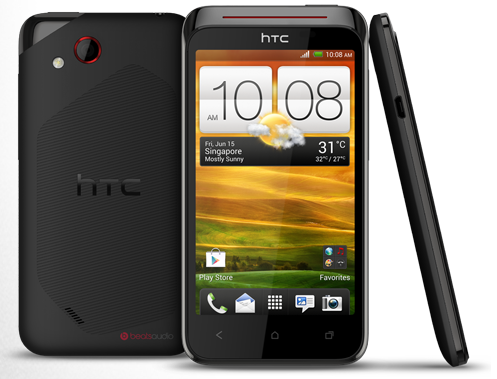 HTC desire VC has 4" (480X800 pixels) WVGA touch screen powered by 1.0GHz processor. It runs on android 4.0 (Ice Cream Sandwich) with HTC sense 4.0 UI. HTC Desire vc has 5MP auto focus camera with flash and it is available in India at Rs. 21,999. Desire vc gives 25GB of free Dropbox storage space free for 2 years. Check below the complete specification of HTC Desire VC. HTC Desire VC is a premium device has a brilliant 4-inch display. Features are 4.0 Android Ice Cream Sandwich operating system, 4 GB internal memory storage and 512 MB RAM up to 32 GB via microSD card, Wi-Fi hotspot and DLNA support, 5 megapixel camera, standard Li-Ion 1650 mAh battery.